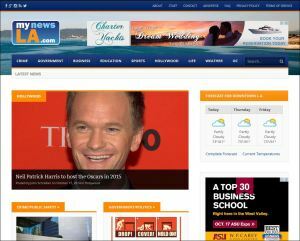 MyNewsLA.com, a sister site of Times of San Diego, officially debuted Monday with timely coverage of local news for Los Angeles and Orange County. Online readers in Southern California will find breaking news around-the-clock, plus a free daily newsletter presenting all the breaking stories overnight. There is full coverage of politics, crime, business, education, sports, Hollywood, lifestyle and weather, along with a separate section for Orange County. The site offers content from official sources, wire services, the public relations community and its own staff of five editors. John Schreiber is senior editor for the site. Contributing editors are Colleen Park, Debbie L. Sklar and Alexander Nguyen. Chris Jennewein, who is editor and publisher of Times of San Diego, serves as editorial director for the Los Angeles site. The site is mobile friendly, using the latest “responsive design” to automatically re-size for smartphones and tablets. By placing a link on your home screen, you can navigate directly to the news. If you have questions about the site, or wish to send press releases or announcements, please direct them to news@mynewsla.com.